Haircuts: This past weekend while visiting my aunt and uncle in Ninilchik something possessed me to ask if they had hair clippers and scissors. They did, so I got Denver on the chair and started shaving. I've shaved him bald before, but never actually tried to cut his hair with any style, but this time I did. I think it turned out pretty cute; Denver has mixed feelings about it. He even added a prayer when we said grace the next day that "Mom learns how to cut my hair better!" Aurora was next, which was pretty easy since I have trimmed her bangs before. I even went at it with the thinning shears and I think I went maybe a little overboard with them, but bangs are bangs and Aurora's not complaining. Amazingly, I got Doug in my chair! I'd been badgering him to get a haircut for weeks, but he rarely gets to Homer (even more rarely during the day when salons are open), and even he thought $30 was too much for a guy's haircut. So I revved up the razor and away I went. I didn't think it was too bad, but you notice I'm not putting a picture here. My aunt kept telling him to give me a couple times to get the hang of it. Anyways, I would never, ever have done this in Michigan. Since our car was in the shop yesterday, and I needed to get to Homer, Doug took the 4-wheeler to work. He strapped on his bag of school papers, popped the kids on back to take up to the bus stop, and then zoomed off. He was able to go about 15 mph faster on the 4-wheeler than in his vehicle. He said it sure didn't seem any faster. Since the bus stop where the kids get dropped off is 1/2 mile from our house, they like it when I can walk up to the stop and meet them when I can. 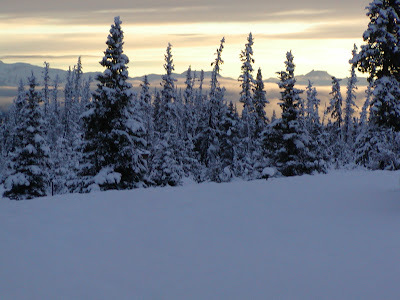 Well, what with all this snow, I decided to ski up there. The roads are all covered with snow so my skis wouldn't get scraped up. The kids thought it was kind of cool, but they wanted to be on skis themselves. Plus I ski a lot faster than they can walk, so they spent most of their time running to catch up with me! 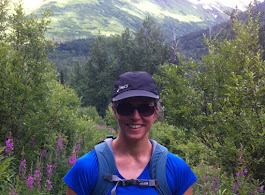 Maybe I'll snowshoe next time??!! (I am adding this picture of the canyon quite a few months later. The picture of the house across it is the neighbor with the gun, who took me up to Steve's place.) Steve, our car mechanic, lives across the canyon. His house is right there, not more than a few hundred yards away. When he called me this morning and said the car was ready to be picked up I flippantly said, "I'll throw on my snowshoes and be right over." I hadn't believed our landlord when she said our Steve lived "across the canyon." I thought she was exaggerating. Well, I discovered that a canyon it was, and I got quite a workout snowshoing across it. A few minutes turned into quite a few minutes later! As I said, I put on my snowshoes and headed west towards one of the two houses that can be seen from our house. I had picked through the alder bushes this summer looking for leaves to compost, so I'd been that way. Just past the alder bushes, though, I came to the edge of "the canyon". I was startled. I wouldn't say it is more than 50 feet deep, maybe 100 at the most (hard to tell with all that snow). The sides were steep and bush-covered. I didn't like the alternative (walking up to East End Road and crossing where the canyon begins), so I plunged on. The snow was so deep that the bushes were bent over double so I was (mostly) able to walk right over the tops of the bushes. Cool! I thought. A small stream ran through the bottom, but I was able to step over that and then clamber back onto the tops of the bushes. Going up the other side was a little trickier. Luckily there were small trees I could use to pull myself up. When I got to the top there was a big mound of snow from the plows. I could hear a dog barking madly on the other side. I peered over the edge and saw my neighbor staring at me in amazement. She was outside trying to figure out what her dog was barking so furiously at. She'd been expecting a moose, patting her back where she had her pistol, and telling me about a mad moose that wandered into her yard three years ago. I wasn't a moose, and nor was I at the right house. She invited me in for tea, but I declined since I didn't want my mechanic worried, wondering where I was. She walked me up to Steve's, and when she told him I'd walked across the canyon he stared at me in astonishment. I think I am going to provide these native Alaskans with an entertaining story. And I have a lot more respect for canyons now! The first big snowfall has brought out an unsurpassed beauty beyond what I could have imagined. Even the unsentimental, pragmatic Doug ooohs and aaahs about how beautiful the drive to school is, with the road deep in untouched snow and the evergreen boughs laden with white stuff. Mountains that we look out the window and see daily suddenly have taken on new dimensions and we see them with fresh eyes. I took these photos Friday evening as the sun was setting, and the air was aglow with pink light. We got about 8-10 inches of snow during the day (it was just beginning as we headed out the door in the morning). 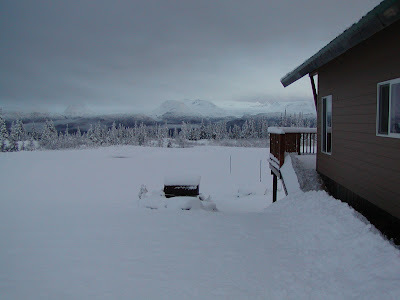 The fascinating thing is that Homer had virtually no snow while we were getting dumped on. Just past mile 10 of McNeil Canyon School the road heads down off the bluff and the elevation cutoff is such that the snow becomes rain. Friday morning it was actually snowing all the way into Homer, but it didn't "stick". The snow "sticks", or stays unmelted beginning at McNeil Canyon School. The temperatures warm up more in Homer, so snow turns to rain and snow gets washed away or melts. Along with the incredible beauty, the snowfall brings icy roads. Thursday night as I headed home from the Greenhouse Gardening class I am taking at 9:30 p.m. I had only a few feet visibility the last 10 miles home (past the point where the rain turns to snow). Unfortunately, the road in the last 10 miles is narrow with steep dropoffs and no guardrails, many hairpin turns and tight curves and generally challenging driving conditions in the best of times. With virtually no visibility I was down to a crawl since I never knew when another curve would be upon me. I know every curve of that road by now, but when normal landmarks are gone it is a little disorienting. I was guided home by the reflective posts on the side of the road. Friday morning had its own challenges since the snow was accumulating quickly, so the roads were now slippery, or at least had the threat of slipperyness. Since the stakes are so high (if you go off the road in the dark, down one of the canyons or off the bluff, no one would ever see you down there), I err on the side of being cautious and opt to stay on the road but get places slower if I don't know whether the roads are slippery or not. The elevation change offers its own threat, since somewhere along the way there is often ice, between the snow and the rain. Three busses were sitting on the side of the road putting chains on their tires Friday morning as I headed into town. They have an emergency plan and the roads were bad enough for them to go into action that day. Such tradeoffs. I love the beauty out here, and if I lived in town in Homer I would never know how different it is out here in the country. Homer is brown and drab to our glorious Christmas-card perfection. I really begin to feel I live in two different worlds as I drive into Homer each day. I am curious to see if the snow will begin to "stick" in Homer like it does up here. 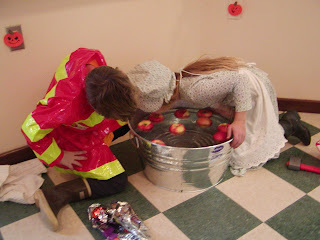 Next we went to Smoky Bay Natural Foods where they had apple bobbing (Denver and Aurora are pictured above). It took Denver awhile, but he finally got one. His waterproof fireman's suit came in handy to keep him dry! After Aurora got hers the kids wanted ME to bob (at the suggestion of the clerks at Smoky Bay). Since I don't remember bobbing for apples before, I was game. Luckily, I picked up some pointers from watching the kids (push it up to the side and then use your teeth!) so I got one quickly. Our reward was to keep the apples, carmel apples and cookies too! Later we headed up to Mountainside Drive, which we were told was the best place to trick-or-treat in Homer. The kids filled up their bags pretty quickly, so then we headed down to Homer High School where a local church was sponsoring free hot dogs, kettle corn, spiced cider and punch. The school commons was full of people warming up and enjoying food and company. There was a carnival at 7:00 at the high school as well, which we didn't stay for since the kids were eager to get home and sort their candy and start trading! All in all, we were happy with the many events for Halloween. Aurora's Little House on the Praire outfit my mom made her still fit (for the 3rd year! ), and I had a matching dress and bonnet that I wore for the first time!